This simulation is designed to help learners visualize atomic structure, as they drag protons, neutrons, and electrons to construct an atom. As particles are moved into place in the nucleus or the electron orbits, the simulation automatically displays the net charge, mass number, atomic symbol, and name of the element. After practicing with atom-building, users can test their skills against the clock in a game with four levels of increasing difficulty. 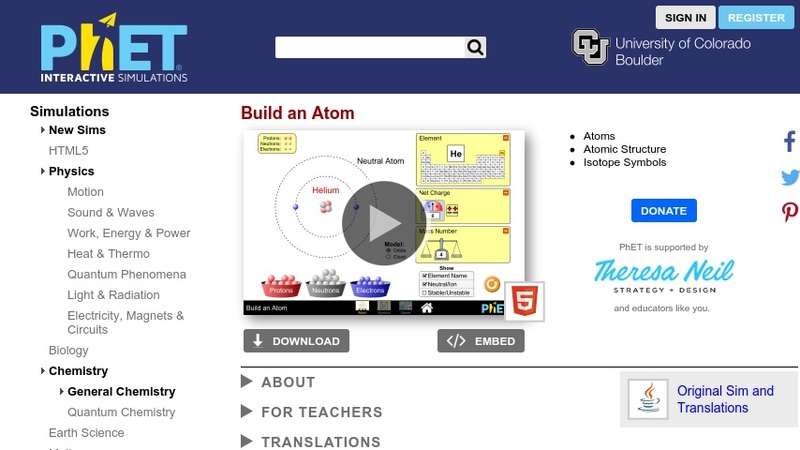 See Related Materials for a lesson plan and student guide developed by the PhET project specifically for use with Build An Atom. The atom building simulation, which must be open and displayed to complete this activity, is available from PhET at: Build An Atom. This lesson is part of PhET (Physics Education Technology Project), a large collection of free interactive simulations for science education.